January 2017 – Combining scanning tunneling microscopy (STM) and density functional theory, we unambiguously identify Cu intercalated on the octahedral site in the van der Waals gap of 1T-CuxTiSe2. 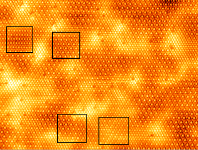 STM imaging shows that at low Cu content (x<2%) the CDW tends to form stripes while at higher contents (x>5%) it forms short-range ordered domains which tend to be phase shifted. Tunneling spectroscopy shows a well developed gap below the Fermi level associated with the CDW. We find Cu to behave as a band dopant, where the chemical potential is increasing with increasing Cu content and electron states are contributed to the Fermi level.